Yiannopoulos’s own attempt at mainstreaming failed miserably, thanks to numerous scandals and self-inflicted wounds, but he remains one of the most popular figures on Gab, despite—or, rather, due to—his reputation as a white-nationalist sympathizer. Even without Yiannopoulos as a leader, Gab has become a welcome haven for his ideas, which in the following two years became a notorious redoubt for a wide spectrum of far-right pot-philosophizing, from pro-Trump nationalists to outright white supremacists and neo-Nazis. The site soon grew a small but steadfast following, increasing its membership virtually every time a popular far-right figure—such as white nationalist Richard Spencer, or MTV host-turned-Holocaust denier Tila Tequila—got de-platformed elsewhere and moved their online presence to Gab.com. It became a cause célèbre for anti-social-justice-warrior media icons such as Ann Coulter, and received increasing support from figures like Tucker Carlson, who drew criticism after interviewing Andrew Torba, the Silicon Valley programmer who founded Gab.com, on his show. (Naturally, the backlash to Carlson’s interview prompted Breitbart to accuse his critics of being anti-free speech.) But in the past week, Gab has become known as the social media base for a man who committed what is believed to be the deadliest act of anti-Semitism in American history. 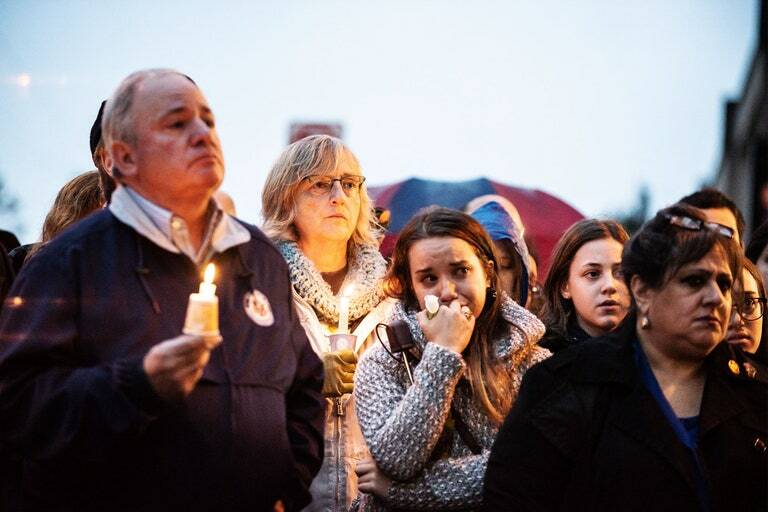 Before he opened fire inside the Tree of Life synagogue in Pittsburgh, killing at least 11 people who had gathered for Shabbat services, Robert Bowers, the alleged shooter, found a safe space to express the anti-Semitic hatred that was consuming him. “There is no #MAGA as long as there is a k*** infestation,” Bowers wrote on Gab.com. On Twitter or Facebook, Bowers’s views would have gotten him banned; on Gab, he fit right in. “Jews are the children of Satan,” read his profile. And toward the end of his post history—filled with even more violent, anti-Semitic and anti-minority content—he increasingly indicated that he would start acting soon. “I can’t sit by and watch my people get slaughtered,” Bowers wrote on Saturday. “Screw your optics, I’m going in.” Moments later, he began his shooting spree. Although the site advertised a strict no-tolerance policy against posts calling for violence, self-harm, or threatening language, moderation was often lax. Eventually, members were evicted for much more arbitrary reasons. Prominent white nationalist Paul Nehlen, who challenged Paul Ryan for his Wisconsin congressional seat, had a rich history of anti-Semitic trolling, but was banned for doxxing one of Gab’s highest-profile members. In turn, Gab’s failure to enforce the rules often led its own members to deliberately test the limits of its policies, practically daring moderators to ban them. When prominent white nationalist Andrew Auernheimer, also known as Weev, got booted, Gab’s users protested, saying the site tolerated far worse than him on a regular basis: “#gasthekikes is a constant statement on here and people are not getting banned, neither should Weev have been,” one wrote. The internal debate over exactly how much hate speech the community could tolerate reflects a broader argument within the right over how to spread their ideas throughout the Internet—whether by “red-pilling”, a.k.a. sneaking fascist, racist, or anti-Semitic views into larger society by presenting them as reasonable alternatives to apparently strident liberal voices (“social-justice warriors“), or by overt action, such as rallies and marches, neo-Nazi imagery, and racist chants. (Donald Trump himself is a controversial figure in this debate, with some on the far right praising him for helping to “red-pill” the “normies,” while fascist activists accuse Trump and the far right of “paralyzing the supply chain” by providing a moderate alternative to full-on Nazism.) The Charlottesville rally in 2017, which left a protester dead, was intended as a direct rebuke to the “optics cucks,” who preferred the former tactic. The debate became a major dividing point, apparently with extreme real-world consequences. Nehlen was a harsh critic of the “optics cucks.” Bowers, too, wrote “screw your optics” before he began his shooting. The revelation of Bowers’s horrifying online presence spurred tech companies to action: GoDaddy booted Gab from its platform; PayPal, Stripe, and Joyent de-platformed the site; Medium removed Gab’s account. Some saw these companies’ hasty actions as hypocritical—after all, they claimed, the tech world had known about Gab’s Nazi problem for months, and done nothing. But the swift punishment did not quiet the Gab community. On the contrary, it seems to have validated the far right’s victimhood complex. “The attacks from the American press have been relentless for two years now and have taken a toll on me personally,” Ekrem Büyükkaya, Gab’s C.T.O., wrote when he resigned from his position on Sunday.